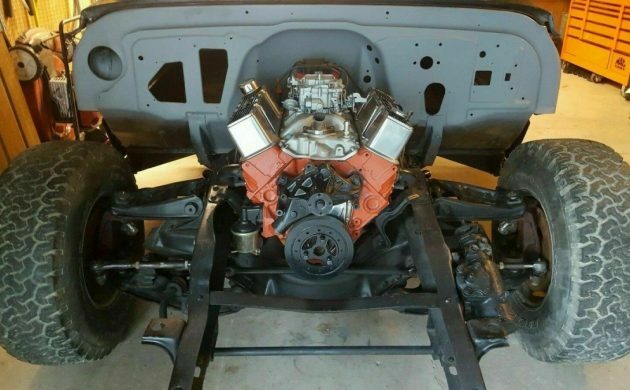 Okay, so maybe using the term “some assembly required” might be understating things ever so slightly, but once the assembly is complete, this 1967 C10 Pickup really promises to be a great vehicle. 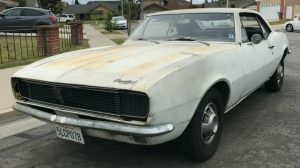 It is one of those vehicles where a project has been started, but the owner has decided to part with it. Located in De Pere, Wisconsin, it is listed for sale here on eBay. The owner started this as a frame-off project, and now that the frame has been restored, the majority of the running gear has been installed, and the cab is mounted back onto the frame, that’s as far as it’s gone. The frame looks really good, the cab is solid and nearly ready to be painted, and there is a great supply of new panels and trim ready to be installed. 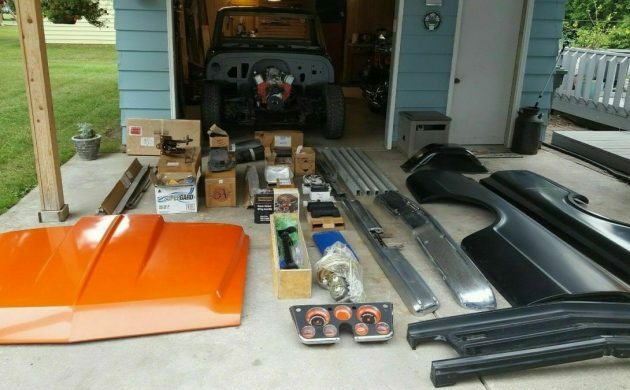 These parts include new doors, fenders, inner fenders, inner door panels, all new chrome, steel cowl hood, new stake-hole delete box sides, and numerous other trim pieces. Nestling in the engine bay is a 350ci 4-bolt engine, and this has been given a recent refresh, with a new oil pump, new timing chain, and a new carburetor. Obviously, it currently doesn’t run, but it should be ready to go once the Pickup is completed. The vehicle has been fitted with a disc brake conversion, while the suspension has been lowered substantially, and has also been fitted with new suspension bushes. 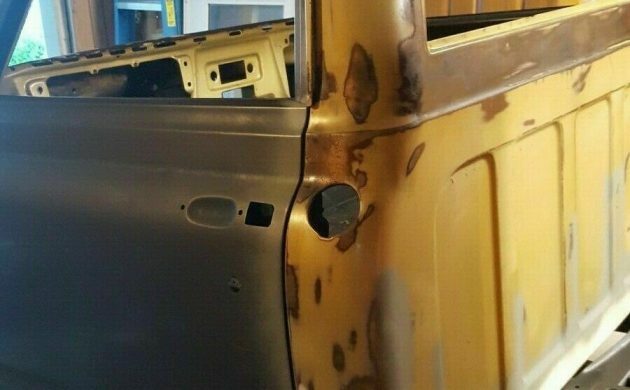 Given the level of disassembly of the C10, it is no surprise to see a bare interior. However, it does give you an opportunity to see just how clean the floors are. 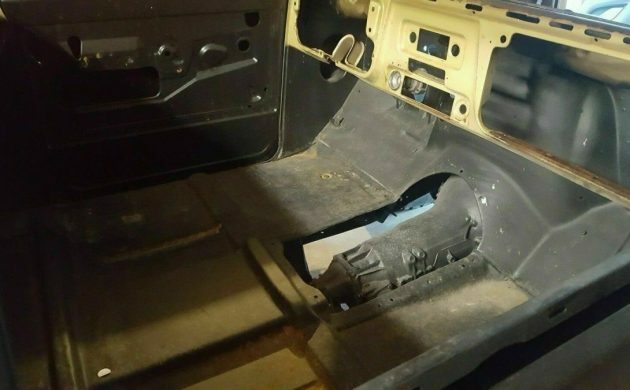 There are some nice components that are ready to be installed, including a custom tilt column, a rebuilt instrument cluster, new armrests, new door handles, and it also looks like there might be some new sound deadening and trim material present as well. The only thing that I can’t see is a seat, so I’m not sure what the story is there. This is a project that won’t be for the faint-hearted, but when you look at what is included with the vehicle, it does show a lot of promise. 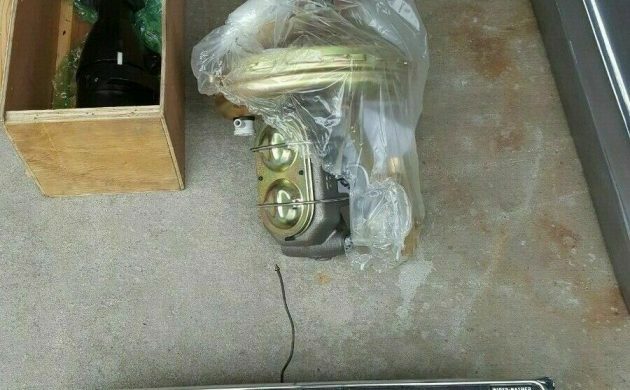 The owner claims that there is $12,700 worth of new parts included with the C10, and that figure doesn’t surprise me. At the time of writing, there are still 9 days left on the auction. At this point, the top bid is $2,550, but the reserve hasn’t been met. Take a good look at it and tell me if you’d take this project on. The Seller has put a lot of effort into this truck to get it to where it is now! I hope that his dream died easy. If the final bid stays low this could be a good way for an ambitious person to get into a vintage truck. This won’t be a one-trip collection unless you have a large carrier for the roller and all of the loose parts. I’d want my support group there to help inventory, pack and load this one. Good luck to the Seller and the next owner! The other thing to use in your final valuation is that it appears to be a long bed. I prefer the better ride in my 68. It does make a difference in the value of a truck. The old debate about short bed vs long bed… I’ve always had long bed trucks and prefer them. I feel like for me it’s an appearance thing more than bed room or ride. I appreciate the larger gas tank that you might get on the long bed models but don’t know if that’s always been a thing or even if it’s still a thing. From a utility point of view, an 8′ box just makes sense. I have no use for anything shorter.I agree with NotSure, they also look better. 4 wheel drive is also the way to go. I’d love to have it or one like it(6’) and build a nice little street truck! With all that’s here on this one, you’d practically have a new truck! It may be listed as a 67, but the cab is from a 69 or later truck, you can tell by the location of the holes & indention for the emergency brake & wiring bulkhead on the firewall. Several differences in the dash also between 67, 68 & 69-72, & it’s clearly the 69-72 style. I would wonder how it’s titled. 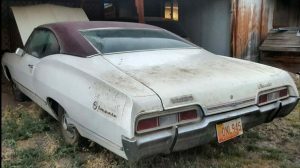 Could be an ultra-great find for someone with a large trailer and lots of energy – best of luck to the new (hopefully)lucky owner!